I hope this strike includes daily errands, as well. Don’t go to the bank, grocery store, out to dinner, put gas in the car, online shop, etc.. Women just stay home. It could have quite an impact. 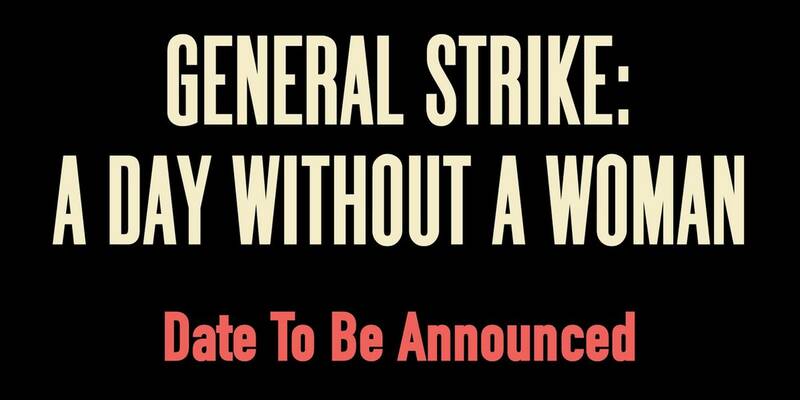 Just as with the last women’s strike on January 20th and 21st, I am conflicted. I did strike everything but work on the 20th and everything but protest on the 21st. I would like to hear others input. I think it’s difficult for everyone to take off work. Hey, I don’t have a formal job, so I’ve been thinking about this. I would like to see A Day Without A Women go beyond the workplace and into stores, banks, gas stations, etc.. This would be an excellent way to make our presence known. Companies fear this sort of thing. Uber isn’t happy right now. Imagine if women said we are no longer buying Pepsi (that is a random example!!!!!). Can you imagine what would happen? Not working is a tough choice for some women — what if you are in health care or teaching? Or if you can’t afford to take a day off? I really love this idea, but I suspect thins kind of thing works for those who are fired up and can afford to be away from work for a day. A boycott for a day — or something that might be disruptive (but not destructive) might send a similar message but also invite more participation.